SUV's are the flavour of the day, or should I say decade. Their popularity and demand is growing daily and not just in India, but also globally. Almost every manufacturer, even those that once scoffed at the very idea, are now making SUV's. This race to secure a slice of the growing SUV market has led to many new ones being introduced. 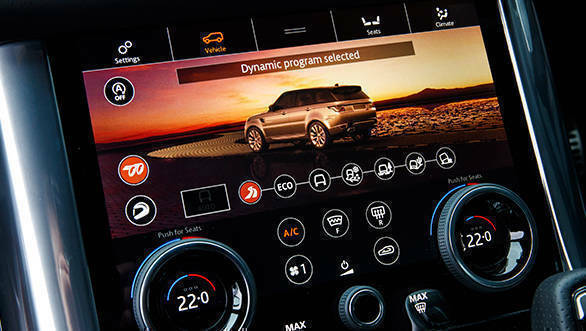 Manufacturers like Land Rover that already enjoy an enviable image and reputation as makers of some of the world's best SUV's are also constantly improving and re-inventing their products. A very good example being the Range Rover Sport SVR . 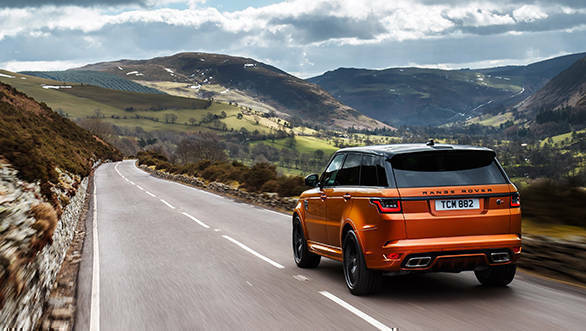 The Range Rover Sport SVR is the fastest Land Rover ever built and is a direct result of all the work done on it by Jaguar Land Rover's SVO (Special Vehicle Operations) team. SVO is based at a brand new 'Technical Centre' in Warwickshire, England, and Jaguar Land Rover says it is their "Centre of Excellence". 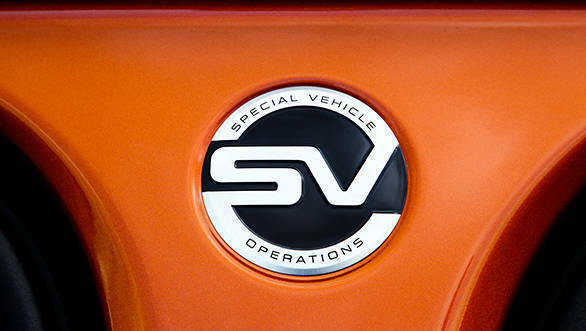 The SVO has a team of 200 automotive specialists and they build limited run collectors' editions and high specification vehicles like the Range Rover Sport SVR. When the Sport was introduced, it was actually meant to be a sportier and more fun to drive version of the iconic and big Range Rover. The Range Rover Sport almost immediately carved a nice niche for itself and gathered its own set of loyal followers. 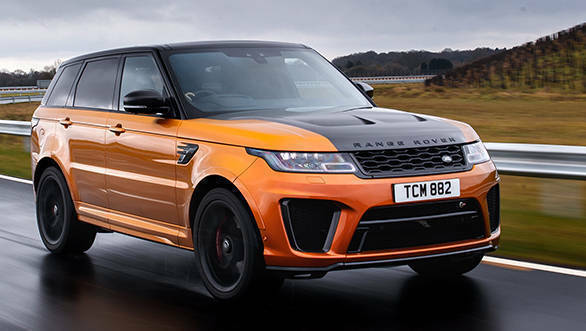 With the introduction of the Range Rover Sport SVR, Land Rover have once again upped the game and raised the bar of the expected sportiness or performance levels in a SUV. To put it simply, the SVO team basically took the already extremely capable new Range Rover Sport, and either modified, replaced, redesigned or upgraded everything on it, to boost the performance. And they did not just limit themselves to the mechanicals. They have custom made body panels and parts to be lighter; added an aero kit to improve aerodynamics; changed the interior and seats to be more sprightly and of course liberally added SVR branding everywhere to announce that this Sport is now a properly hotted up SUV, capable of some really serious performance. Recently the JLR team was generous enough to invite me to sample the Range Rover Sport SVR on the roads around the picturesque Cotswolds region and at their Fen End test track in U.K. As some auto enthusiasts may know, Fen End or RAF Honiley, has a very interesting history. In World War II, a number of RAF (Royal Air Force) squadrons operated from this air-station and after the war, it became a vehicle test facility that JLR purchased in 2014. Being a bit of a military history buff, I was really looking forward to driving at Fen End and could almost imagine the legendary Spitfires and Avro Lancaster Bombers taking off to battle for Britain and the rest of the Allied World. With visions of these fighter planes playing in my mind, driving the Range Rover Sport SVR on the track at Fen Land was that much more fun. Obviously, there is nothing in common between those illustrious aircrafts and the SVR, other than the fact that both have supercharged engines. 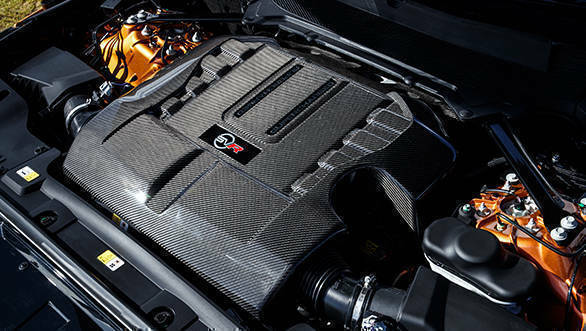 Thanks to all the fine-tuning done by SVO, the 5.0 litre supercharged V8 petrol engine now makes 575 PS and 700 Nm of torque, the same as in the Jaguar F-Type SVR. 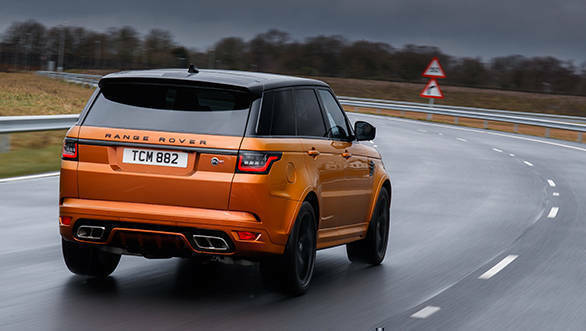 But as the Range Rover Sport SVR is heavier, it takes 4.5 seconds to get from 0 to 100 kph. While this is slightly more than the F-Type SVR, it is still ferociously quick for a SUV. And the top speed of the Range Rover Sport SVR is 280 kph! In World War II, aircraft technicians were constantly working to generate more power and reliability from the engine. Nowadays its companies like JLR and their SVO wing that does this. Talking to some of the SVO engineers, I learnt that forcing more cold air into the engine to improve combustion was one of the things that they focused on and huge air intakes in the bumper and the large integrated air vents in the custom made carbon fibre bonnet aid this. 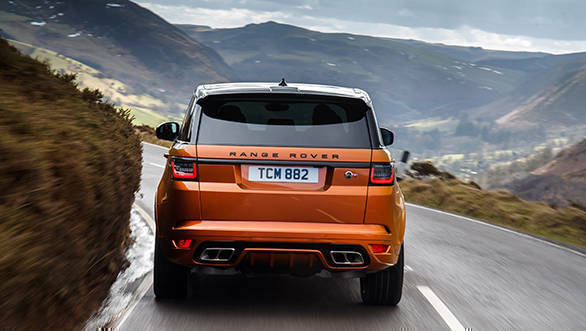 They also revamped the complete exhaust system to allow exhaust gases to exit more efficiently and this improvement in the way the V8 engine breathes, clearly shows in the performance of the Range Rover Sport SVR. The engine springs to life energetically and responds with alacrity. Push down on the pedal and the engine rushes to energetically engage the rev limiter. The highly efficient 8-speed automatic gearbox has apparently also been tweaked for more rapid shifts to ensure it does proper justice to the heightened urgency of the engine. The SVO team has not just stopped at increasing the performance of the engine and gearbox. 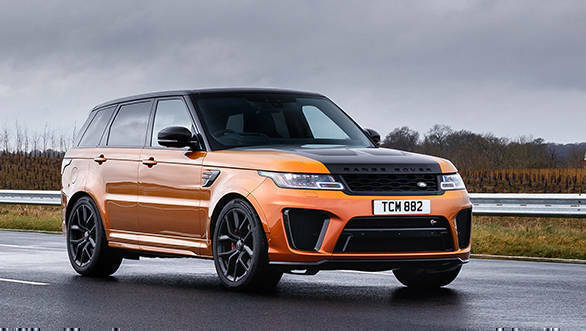 To make the Range Rover Sport SVR an even speedier SUV, they have put it through their 'Special Materials Weight Loss Plan'. As mentioned, the bonnet is made from composite carbon fibre and the lightweight front seats have some magnesium construction in them. The wheels are lighter too. 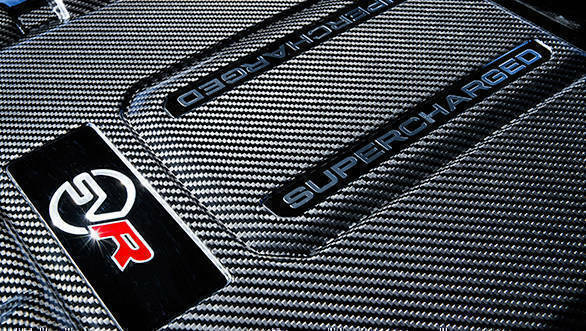 Interestingly, the bonnet comes in the striking and loud, exposed Gloss Black Carbon Fibre. And if you want it in the body colour you pay extra! Yes, you need to pay an additional amount if you want your Range Rover Sport SVR to be somewhat discreet, now how is that for British understated behaviour! Normally one expects the British to not want to attract attention, but maybe the times they are a changing. 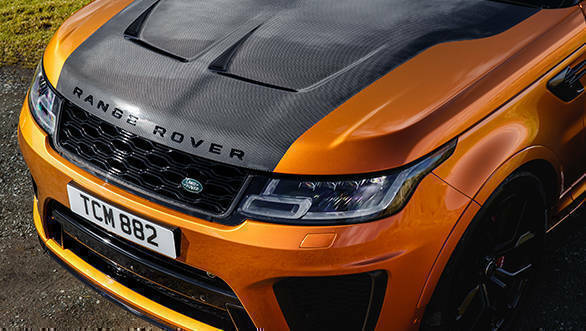 Because the Range Rover Sport SVR comes with the flashy carbon fibre bonnet, and you got to pay up to have it in body colour. Increasing power and improving the power to weight ratio is just one side of the story, managing all of it also requires lots of additional work. To administer the massive torque the SVO team has fortified the drive shafts and other crucial components in the drive train. They have fine-tuned the already well sorted out suspension to control and reduce body oscillations during hard acceleration or braking, and body roll has also been restricted for sharper handling and faster and more precise changes of direction. The steering feels keener and the well engineered all-wheel drive system ensures maximum traction and makes sure all the power is transferred onto the road without the effort of even a single horse being wasted. The highlight of course is that being a capable SUV, the Range Rover Sport SVR does not lose its composure or really bounce around on bad stretches of the road. Yes, unlike many sports cars, the Sport SVR can keep up the momentum, even on badly paved roads. In comfort mode, the ride quality is fairly comfortable and even in the sportier dynamic mode it's not all that bad. Another important factor in fast machines is the brakes, because the faster you go, that much better has to be stopping and slowing down mechanism. 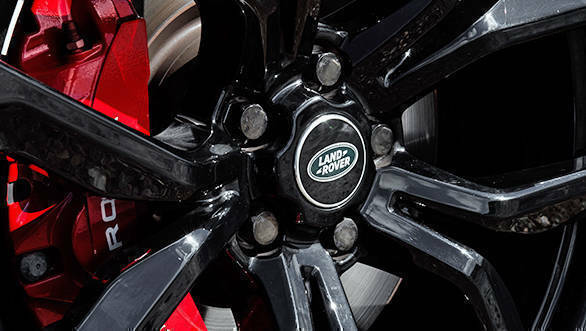 Some engineers I spoke with said that the Range Rover Sport SVR has an extensively upgraded braking system with new thicker and harder wearing brake discs and the calipers are also special high performance ones. The functioning capacity of the brake pads has also been enhanced and their special materials ensure there is minimum brake fade even after heavy and repeated use. The Range Rover Sport always had a spacious and well laid out cabin, and the good folk at SVO have only made it better. 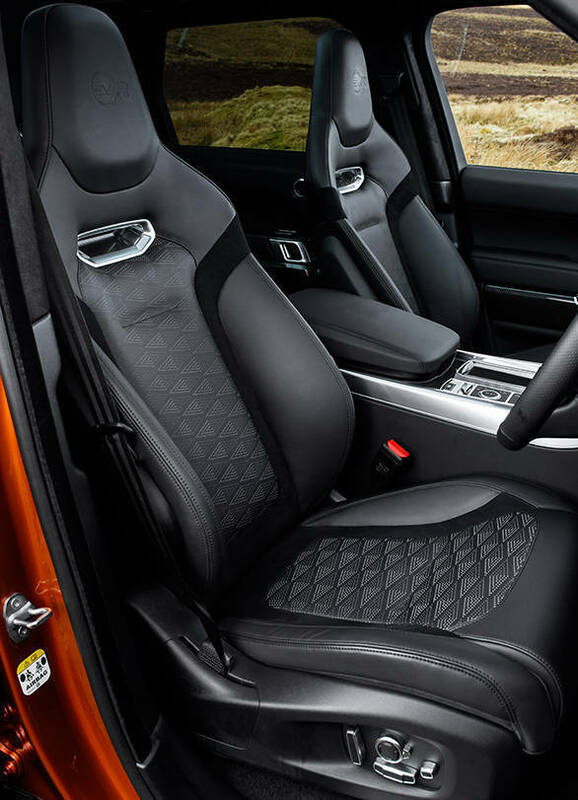 The new lightweight SVR performance seats in Windsor leather hold you very well and are quite comfortable too. They are also offered with cooling as an option, which should be useful in our country. These sleek seats have an embossed SVR logo on the headrest too, and are available in few different colour combinations. The special steering wheel is nice to hold and complements the rest of the design of the interior. Driving the Range Rover Sport SVR on the test track at Fen End in U.K. felt extremely strange; simply because that is the last place you want to try out an SUV. And any manufacturer that allows you to do this has to be really confident about its product. The Sport SVR is a huge and heavy vehicle weighing some 2.5 tons, but the way it goes around the track, is implausible. Floor it on the straight and it zooms forward as if it's a bullet shot from a high velocity rifle. Approaching the turns I was tentative initially, but the Range Rover Sport SVR tackled them in a fantastic manner. The grip levels and agility are awesome and if you push really hard and approach the limit (like I did on a few foolish occasions), the rear steps out but the stability control quickly comes in and corrects matters. What is truly lovely is the super song sung by the engine and supercharger. They work in sync with the exhaust and create the most splendid sound that leaves you awestruck and wanting to have that throaty roar embedded permanently in your head. Another thing that impressed me no end was the fact that despite all the changes to make the Range Rover Sport SVR faster and more fun to drive, the SVO team has not compromised on the all terrain ability. In fact the Sport SVR handled the off-road course we went on so easily, that it left one wondering what this most versatile machine is not capable of. Looking at how rapidly it consumed fuel soon answered that. Yes, the Range Rover Sport SVR sure enjoys its drink and not just sips, but guzzles petrol. And don't expect it to be attractively priced either, when it is launched in India later this year. But then good things in life don't come cheap, do they.